Shiny Alolan Dugtrio in game: 15 Who? Important notice! Pokemon Shiny Alolan Dugtrio is a fictional character of humans. Dugtrio (Japanese: ダグトリオ Dugtrio) is a Ground-type Pokémon introduced in Generation I. It evolves from Diglett starting at level 26. In Alola, Dugtrio has a regional variant that is Ground/Steel. It evolves from Alolan Diglett starting at level 26. 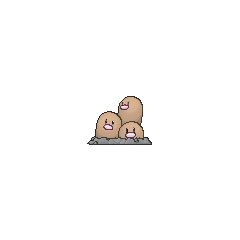 Dugtrio is a set of Diglett triplets sharing a single body. Each head has brown skin, black eyes, and a large, round, pink nose. Dugtrio's three heads think the same thoughts and act cooperatively. In order to make burrowing easier, each head will bob up and down to loosen the soil. Dugtrio can tunnel under the earth at 60 mph (100 km/h) to a depth of 60 miles (100 km), triggering tremors and earthquakes. It is capable of burrowing endlessly. For a brief time, Fissure was its signature move. Dugtrio lives in tunnels and caves under the earth. As shown in the anime, it sometimes lives in hollow trees in forests. It maintains the soil and plants trees to revitalize wooded areas. 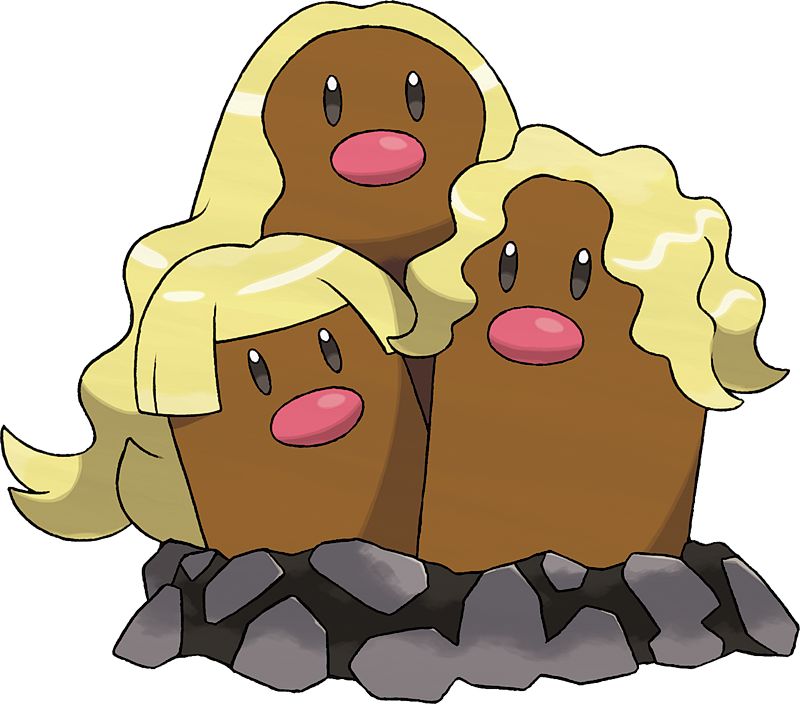 The Alolan Dugtrio appears to look much like other Dugtrio apart from the golden hair each head sports. One head has a bob-cut, the second has curly "shoulder-length" and the last one has flowing hair that touches the ground behind it. This hair is made out of thin strands of steel and it grows slowly and continuously throughout the Dugtrio's life. 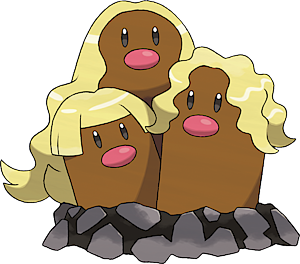 The Alolan Dugtrio is regarded as a feminine fake of the earth and taking its hairs are thought to bring bad luck. 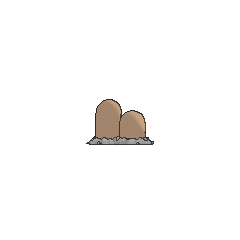 Dugtrio first appeared in Dig Those Diglett!. They worked with Diglett to plant trees in a forest. In The Underground Round Up, Poncho used multiple Diglett and a Dugtrio to rid a town of Electrode. Poncho only used his Dugtrio to get rid of Team Rocket's Electrode Eliminator. Two Dugtrio were among the inhabitants of an oasis just for Pokémon in Got Miltank?. They brought Meowth and Ash's Cyndaquil to the oasis after they got hurt and lost in the desert. Katie used a Dugtrio against Ash during the Hoenn League in Shocks and Bonds. Katie's Dugtrio defeated Ash's Pikachu and was defeated by Ash's Glalie. Dugtrio appeared in the Pokémon Mystery Dungeon: Explorers of Time & Darkness and Pokémon Mystery Dungeon: Explorers of Sky - Beyond Time & Darkness as sentries for the Wigglytuff Guild, alongside Diglett. Two Dugtrio appeared in Making Friends and Influencing Villains!. Dugtrio appeared in a picture in Pokémon Paparazzi. Dugtrio also appeared in Clefairy Tales. A Dugtrio appeared in Beauty and the Breeder where it participated in a Pokémon breeding competition. Pietra used three Dugtrio for her digging project in Right on, Rhydon!. A Dugtrio was seen in the wild in The Legend of Thunder!. A picture of a Dugtrio appeared in Hocus Pokémon. Multiple Dugtrio briefly appeared in Giratina and the Sky Warrior. In One Team, Two Team, Red Team, Blue Team!, Conway used a Dugtrio in the first leg of the Pokémon Triathlon. A group of Dugtrio appeared in A Rivalry to Gible On!. EP031 Dugtrio Ash's Pokédex Dugtrio, the evolved form of Diglett. No specific information available. EP114 Dugtrio Ash's Pokédex Dugtrio. Formed when three Diglett combine. This Pokémon is able to tunnel deep beneath the earth's surface. In Long Live the Nidoqueen! ?, Giovanni is seen to have a Dugtrio as a part of his Ground-type team. It was used to shatter the opening mechanisms on Red's Poké Balls, preventing him from releasing his Pokémon. When a group of wild Diglett appeared in Can You Diglett? where they were seen crossing the tunnel Bruno's Onix made when he battled Red, some of them then evolved into Dugtrio. A Dugtrio was one of the Pokémon sent to help the fight in Ilex Forest in The Last Battle XIII. The Underground Man owns three Dugtrio that help him dig underground, they first appeared in Double Trouble with Dialga and Palkia I. Green's Dugtrio briefly in Red VS Green?!. In the Pokémon Stadium 2 stage, a Dugtrio can be seen on the Ground Terrain situated next to a large rock. Cubone & Pokémon Fossils can also be seen on the Ground Terrain. "A Mole Pokémon. It has three heads that seem to all think the same thing. It lives in caves and is skilled at digging--no matter how hard the ground is, it can dig up to 62 miles below the surface. It's among the fastest of Ground-type Pokémon, a characteristic that can be counted on in combat. Its Sand Tomb is an effective attack that prevents opponents from escaping." Pokémon Pinball: Dugtrio appears in a bonus stage that can be accessed by the Red Table. After the player has knocked out a number of Diglett, they must knock out the Dugtrio that appears to win. Pokémon Mystery Dungeon: Red Rescue Team and Blue Rescue Team: Dugtrio sends the player to Mt. Steel to rescue his son in the third story mission of the game. Dugtrio loves to show off to his son, but often forgets that people can't see him underground. Pokémon Mystery Dungeon: Explorers of Time and Explorers of Darkness: Dugtrio is one of the members of the Wigglytuff Guild. He updates the Outlaw Notice Board and Job Bulletin Board with rotating boards. Like in the previous game, Diglett is his son. He believes that he can swim in the sea, despite being a Ground type. 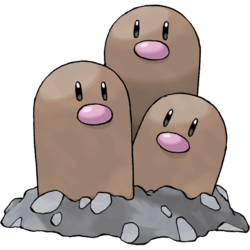 A team of Diglett triplets. It triggers huge earthquakes by burrowing 60 miles underground. A team of triplets that can burrow over 60 MPH. Due to this, some people think it's an earthquake. 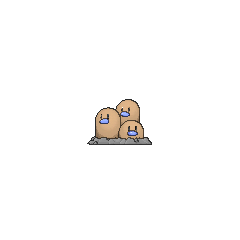 Diglett triplets that always travel together. Known to burrow more than 60 miles underground and trigger quakes. Its three heads bob separately up and down to loosen the soil nearby, making it easier for it to burrow. Extremely powerful, they can dig through even the hardest ground to a depth of over 60 miles. 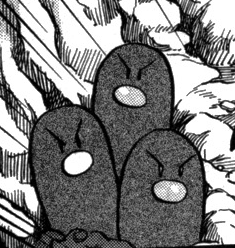 These Diglett triplets dig over 60 miles below sea level. No one knows what it's like underground. Because the triplets originally split from one body, they think exactly alike. They work cooperatively to burrow endlessly through the ground. In battle, it digs through the ground and strikes the unsuspecting foe from an unexpected direction. Its three heads move alternately, driving it through tough soil to depths of over 60 miles. This set of triplets moves cooperatively. It's the power of teamwork that enables this Pokémon to dig to a depth of 60 miles. Despite the closeness between this Pokémon and farmers and other people, no one has ever seen the parts of it concealed underground. Variety Battle: It's Drill Time! Moves marked with a superscript game abbreviation can only be bred onto Dugtrio in that game. 51%-100% HP We three are as one! 26%-50% HP Our health has been reduced to half. Level up We have leveled up! 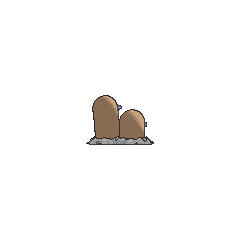 Dugtrio occasionally pops its heads out of the ground, but only very briefly. Mawile asked Dugtrio to hide the Mine Cart Rail in the Cavern Zone. They love to live quietly but sometimes they feel lonely. Dugtrio may look weak, but he was pushy. The incident with Excadrill led him to rethink his actions and his surroundings. For other sprites and images, please see Dugtrio images on the Bulbagarden Archives. Dugtrio and its pre-evolution share their category name with Drilbur. They are all known as the Mole Pokémon. Dugtrio has the highest base Speed stat of all Ground-type Pokémon. In the Pokéathlon Hurdle Dash, Dugtrio and Diglett are seen to go underground rather than physically jump out of the ground. In Generation V, when Dugtrio and Diglett are sent out, they merely fade onto the screen instead of dropping down like all other Pokémon. In the Poké Transfer, Dugtrio and Diglett run between bushes rather than jump. 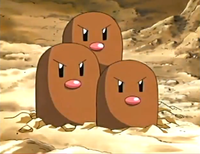 Dugtrio appears to be very similar to the artificial moles used in the Whac-A-Mole arcade games. Alolan Dugtrio's hair may be based on Pele's hair, a thin volcanic glass formed near Hawaiʻi volcanoes. Dugtrio is a combination of dug (past tense of dig) and trio (a group of three). Cantonese Chinese 三頭地鼠 Sāamtàuhdeihsyú Literally "Three-headed ground rodent" or "Three-headed moles"